God is the God of the turnaround. From Esther, to Jonah, to Ruth, the Bible is filled with accounts of God’s faithfulness to turn negative circumstances into victories in the lives of those who love, trust, and follow Him. 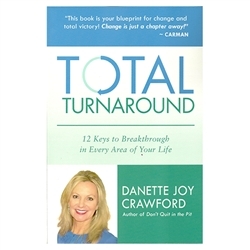 In her latest book, Total Turnaround, Danette Crawford reveals the keys to obtaining total turnaround in every area of your life so that you can live in the victory that God wants you to have. Trusting in God’s timing and technique for your turnaround. Developing a dynamic prayer life. Fine-tuning your focus on following God obediently. Cultivating the mind-set of trust, faith, hope, and expectation. Making God your priority relationship, and the rest will fall into place. And seven other critical insights you need to have. 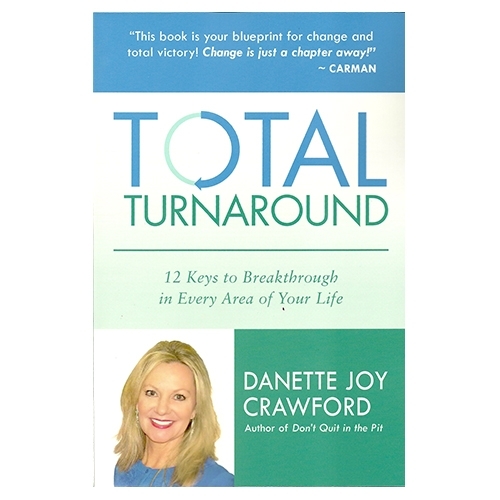 Danette Crawford is a powerful international evangelist, speaker, and TV host with a refreshing message of hope and encouragement. She’s the Founder and President of Joy Ministries Evangelistic Association where she does inner city work with over twenty compassion outreaches to the poor, the fatherless, single moms and widows. She heads a thriving television ministry whose feature program, Joy in the Morning, is seen nationwide in over 165 million homes. Danette holds a Master’s Degree from Regent University. Her and her daughter reside in Virginia.